Motto: "Five Races Under One Union"
Manchukuo was a puppet state of the Empire of Japan in China and Inner Mongolia from 1932 until 1945. It was first a republic, but in 1934 it became a constitutional monarchy. It had little international recognition and was under the Unoffcial control of Japan. The place, called Manchuria, was the place of the Manchus, including the kings of the Qing dynasty. In 1931, Japan occupied Manchuria after the Mukden Incident. A pro-Japanese government was created one year later with Puyi, the last Qing emperor, as the nominal regent and later emperor. 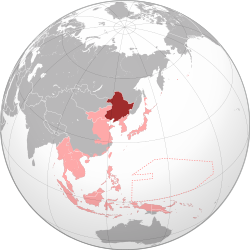 Manchukuo's government was removed in 1945 at the end of World War II. The Soviet Union invaded in August 1945, and formally transferred the territory to Chinese administration in the following year. Although the territories came under the jurisdiction of the Nationalist government, the brief Soviet occupation helped make the region into a base for the Chinese Communist troops led by Mao Zedong. The People's Liberation Army got Japanese equipment and a strategic advantage against the National Revolutionary Army led by Chiang Kai-shek. Manchus formed a minority in Manchukuo, whose largest ethnic group were Han Chinese. The population of Koreans increased during the Manchukuo period, and there were also Japanese, Mongols, White Army Russians and other minorities.[source?] The southern part of the Liaodong Peninsula was ruled by Japan as the Kwantung Leased Territory. ↑ C. Peter Chen. "Manchurian Strategic Offensive Operation | World War II Database". World War II Database. Archived from the original on 4 September 2015. Retrieved 10 September 2015. ↑ Borisov, O. (1977). The Soviet Union and the Manchurian Revolutionary Base (1945-1949). Moscow, Progress Publishers. This page was last changed on 24 April 2019, at 14:46.